“About time we had a builder in the White House, right?” Trump told union members. 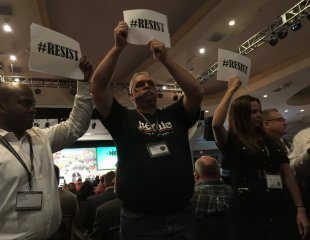 The resistance movement met Donald Trump head-on at North America’s Building Trades Unions (NABTU) National Legislative Conference in Washington, D.C., Thursday, as protesters serenaded the president with a cacophany of boos. 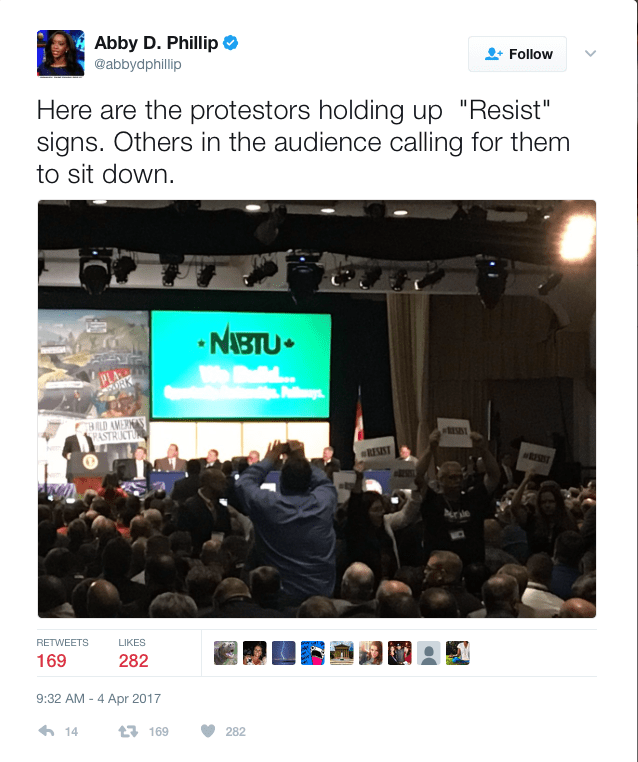 Demonstrators bearing placards were escorted out shortly thereafter. The protesters included members of the IBEW Local Union 569, which represents 3,400 electrical workers in San Diego and Imperial Valley and the San Diego Building Trades Council. “With my brothers and sisters of IBEW 569 and the San Diego Building Trades Council, we stood up for workers and unions, and we resisted lies, misogyny and attacks on the middle class!” said Gretchen Newsom, political director of the electricians’ union. NABTU endorsed Hillary Clinton in the 2016 presidential election after having previously endorsed President Obama for reelection in 2012.